← Make a Resolution to be Humane. From the wheels used by Ricky Bobby rescued by HSUS to the pee pads at my back door, special needs can be met for our dog companions. Not all disabilities are visible and not all involve mobility wheels. Let me tell you about one of my special needs kids, and this isn’t about my sweet Sophie whose special needs were evident to the eye. Following are some touching tales and videos of other dogs. If you can’t glean the meaning of this blog I will tell you at the end. My dog Jax has Diabetes Insipidus. This is a need not visually evident. He was in the home of a foster and the rescue group had deemed him ‘unadoptable’. But his fosters loved him and knew otherwise, they had even taken him to TAMU for evaluation on their own dime and that deserves a big WOW. Diabetes Insipidus is a condition that presents with excessive thirst and urination, not enough anti diuretic hormone is produced. Jax was a 6 month old pup and none of the treatments available helped. He was a pee-pot with little control. They needed to find my boy a new family for legitimate reasons and wanted to give Jax the best home possible. I went to their house to be interviewed and approved. I went outside and sat down on the ground. Jax ran around playing, urinated and went immediately to the water bowl. When he saw be he bounded over with enthusiasm and peed all over me. His foster parents looked horrified waiting for my reaction. I hugged Jax and said, you just christened me. Pee happens. I have tile floors and pee pads at the back door. As he matured his control improved though the health issue remains. Sometimes he has accidents, usually when he jumps, gets scared or excited he leaks. I don’t care, he can’t help his situation. And Jax is loving, loyal, well-behaved and a wonderful boy. I am grateful he is in my life and he certainly deserves love and care. All animals deserve love and care. Pee happens. I have tile floors and pee pads at the back door. 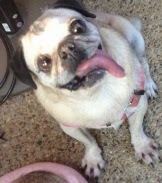 From DFW Pug Rescue: One of our special rescue pugs, Chaplin, was adopted by VCA University Animal Clinic in Dallas, TX. He has neurological issues that we have been treating with acupuncture and intestinal motility issues that are treated with a combination of three medications and a special diet. One of our amazing volunteers offered to continue the acupuncture treatment; she picks him up at VCA and gets him to the acupuncture doctor when needed. Chaplin needs medication for the remainder of his life, as well as neurological check ups, so for the doctors and staff at VCA to assume this responsibility is nothing short of awesome! He goes home with a member of VCA at night and on weekends. This is a video of him hanging out at the clinic, such a happy boy.This link http://youtu.be/cm-WF5op6yk shows the challenges Chaplin faced with mobility. Do you remember my posts about sweet Rosie and Remember Rosie? Thank you Rosie and your Mom for helping bring awareness. Rosie was rescued from a puppy mill and had genetic disabilities. But she was a joy and deeply loved, fun and playful. Products To Help are Available! Chaplin had a custom made wheels. But there are resources for our friends with disabilities. One of the most heartwarming sights I have personally seen was when I visited a friend at her apartment. A neighbor was taking is handicapped German Sheppard for a walk using a sling to help him down the stairs for his walk. Wheelchairs, slings, ramps, diapers, strollers, splints and more. 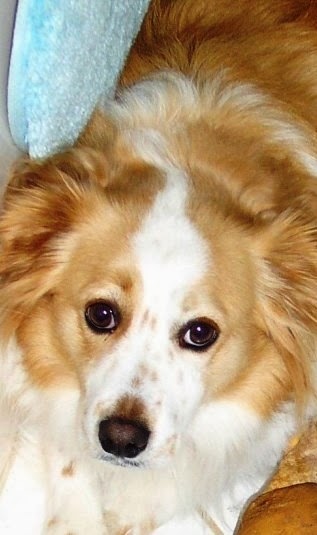 For example: from Canada http://www.dogquality.com/, the U.S. http://www.handicappedpets.com/ and http://eddieswheels.com. This is an ad for doggie wheels nevertheless is shows happy dogs given mobility again. I didn’t forget cats. Bobby was left in a box on the vet’s doorstep as a kitten. He has spinal injuries and a broken tail. He walks strangely on his back legs and must wear bandages and care to protect his legs. The video is 9 minutes long but shows how he is enjoying life even though he walks a bit differently, playing and obviously loved. Napoleon has his own wheels. Bumblesnot is a 10 year old black pug rescued from a shelter in 2011. Click the link to learn more and follow his adventures on Facebook. When this boy was adopted he had some mobility issues with his back legs. Now he has his wheels and his family must suppress his bladder. But he is happy and loved. If you click the video link know 1) It starts with loud music and 2) I’m not sure I care for the “proper care instructions” are presented audio wise but you do learn more about the care of this disabled and lovable boy. THE MORAL OF THIS STORY IS DISABILITIES DON’T MEAN AN ANIMAL SHOULD BE NEGLECTED OR DESTROYED. THEY DESERVE LOVE AND CAN HAVE A GOOD QUALITY LIFE.BE THE CHANGE! Raining Cats and Dogs by Peter Martz. Sounds beautiful but is so very sad. Claiborne Animal Shelter is a 501c3 organization run entirely from donations and volunteer labor. If you’d like to learn more about us, please visit http://www.ClaiborneAnimalShelter.com or visit us on Facebook! 12/26/13 to 1/10/14 After Christmas Special! I Love Dogs and Animals · Animal Rights Activist too!